There are many good reasons why time-tested metal braces remain popular — because they offer a reliable, effective and economical treatment option. 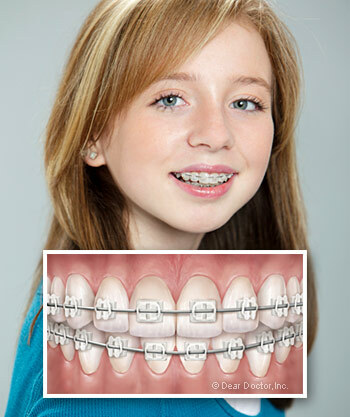 In contrast to the appliances of the past, today's braces are actually smaller, lighter, and more comfortable to wear. If you want a less traditional look, you may be able to choose colorful elastics for the brackets, or other modifications. 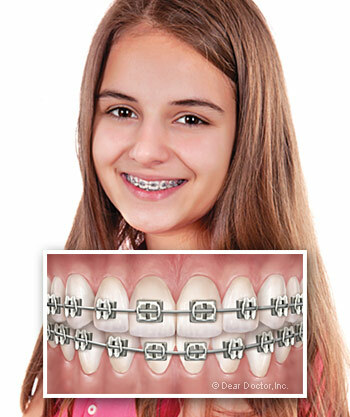 We provide treatment with traditional metal braces to the residents of Altamonte Springs, Lake Mary, Longwood, Sanford, Heathrow, Casselberry, Wekiva Springs, Maitland, Forest City, Orlando, Deltona, Debary, Orange City, Apopka, Oviedo, Winter Springs, Winter Park, and Seminole County. Several types of ceramic braces are currently available, and the technology is constantly improving. Their aesthetic appeal is undeniable... but there are a few tradeoffs. The ceramic brackets can be less durable than their metal counterparts; plus, while the brackets themselves don't stain, the elastic bands that attach them to the archwire do (however, these are generally changed each month.) Ceramic braces also cost more than metal — but for many people, the benefit of having an inconspicuous appliance outweighs the costs. We provide treatment with clear braces to the residents of Altamonte Springs, Lake Mary, Longwood, Sanford, Heathrow, Casselberry, Wekiva Springs, Maitland, Forest City, Orlando, Deltona, Debary, Orange City, Apopka, Oviedo, Winter Springs, Winter Park, and Seminole County.